Saturday March 2, 2019 from 7:-30 AM to 4:00 PM EST. Mustangs & Powered By Ford vehicles will take over the Historic Downtown of Longwood again this year! Anyone who has attended this show knows that it is a real blue oval celebration! 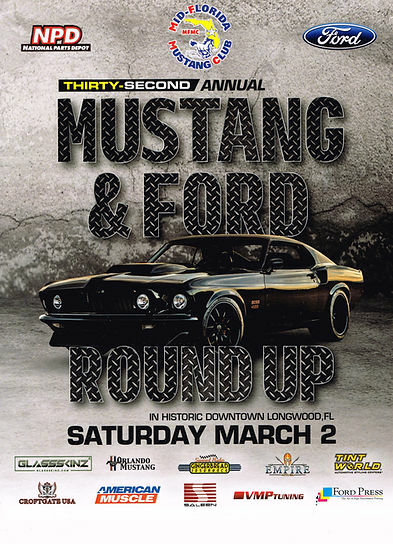 The Roundup is one of the premiere Mustang & Ford events in Florida. More than 300 entries expected. Open to all Mustangs & Ford- Powered vehicles. Free to spectators! March 2, 2019, registration is from 7:30 am - 9:30 am. Opening Ceremonies will commence at 10 am and the show will conclude after awards presentations at 3 pm. MCA national show rules state that all show cars must have an acceptable fire extinguisher at all times. Taz Tunes will be supplying the music throughout the day to add to the fun! There will also be great vendors to talk with. With MCA modified judging classes and Popular Vote classes, this show has something for Fords of all years and their owners. The MFMC expects to award more than 250 trophies during the show of more than 300 cars and trucks. Anyone with a Ford Powered Vehicle is welcome to enter the show. Local eateries and food trucks are available to provide you with lot of fun choices for lunch. Dash Plaques to the first 200 vehicles registered! All vehicles entered are eligible for the “Best Of Show” award. All Pre-registered cars must be in place by 9:30 a.m. on the day of the show, or their spaces may be given to others seeking day-of-show entry. Space is even more limited this year than in past years, please make sure to register early and arrive early. All entries, pre-registered and day-of-show are limited to space availablity. Collector Event T-Shirts are only $12.00 this year pre-purchased with registration. Limited quantities will be ordered for those interested and order early. Shirts must be picked up at the show on 3/2/2019, no refunds will be given. A small number of additional t-shirts will be available for purchase at the show at a rate of $15. You will need a different email address for each car or truck entered. Please remember to complete all the information, including class details for your registration to be complete. The entry fee or car corral fee may be paid online with a credit card, debit card or through paypal. Click on the flyer graphic above to see/print the flyer. Q. How do I know which class I should register my vehicle? A. If you have any questions on the different classes and which one would best fit your vehicle.... CLICK HERE and review the different descriptions of the judged classes. Q. If my Mustang is a 2018 or 2019, may I enter in the show? A. Absolutely! You would simply enter it in the Popular Vote class. Q. I want to enter 2 cars, why do I need a separate e-mail address for each car? A. We have streamlined the registration system to accommodate the vast majority of participants who enter only one vehicle. By making the change, we also can make sure that every vehicle registered online will receive a verification and notice. Unfortunately, it does mean that every car registered does require a different email address. If you want to register another vehicle, consider using a different family member’s address or take advantage of the many e-mail servers available, i.e. gmail, yahoo, hotmail, to use for the purpose of registering and receiving confirmation. Thank you for your understanding. Q. I have a business and would like to participate in the vendor area at the show. Who do I contact? Q. Do I need to bring a fire extinguisher? A. Yes, MCA national show rules state that all cars must have an acceptable fire extinguisher available at all times. However, the fire extinguisher does not have to be permanently mounted in the car. Acceptable fire extinguishers must have at a minimum a “B, C” rating and be visible to the classification judge and accessible to the owner.